The unsinkable Titanic was suddenly sunk as it collided with an iceberg. 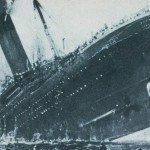 Through a variety of failures, the Titanic was sunk by an iceberg and, due to an equally tragic series of failures in terms of sufficient lifeboats, 1,490 lost their lives. Their regulations had been written in 1894 and they stipulated that every ship over 10,000 tons must carry sixteen lifeboats. The ship’s designers knew that the Titanic could stay afloat if four of its sixteen watertight compartments were flooded, but it could not survive if five were flooded. No one ever suspected that as many as four would be flooded at one time and this fact may have given rise to the idea that the ship was unsinkable. On April 10, 1912, the Titanic left Southampton on its maiden voyage to New York. Next day the ship received radio messages telling of large icebergs that were much farther south than usual. Captain Smith accordingly altered course toward the south, maintained speed at twenty-two knots and gave instructions to lookouts to be especially vigilant. Titanic, on its first transatlantic voyage from Southampton to New York, was eight hundred miles east of Halifax, Canada, on April 15, 1912, when it hit an iceberg. Within a minute or two, a 300-foot gash was cut in the ship’s steel side and about an hour later the Titanic was listing seriously. The captain ordered everyone to take to the lifeboats and two hours later the ship sank. Of the 2,227 passengers aboard 1,490 lost their lives. In the years before World War I there was heavy sea traffic between Europe and North America. Immigration from Europe to the United States was at a peak and the growing industrialization of the United States was a magnet for European businessmen. Ships competed for both economy and luxury travel. Speed of travel was also in demand and some ship owners concentrated on that. In 1907, the British White Star Line decided to build ships that would focus on luxury, size, comfort, and safety, rather than speed. On May 31, 1911, four years later, the first of these ships, the Titanic, was launched. From its moment of launch it was known as a “safe” ship compared with all other vessels of that time. The Titanic weighed more than 46,000 tons, stood eleven stories high and four city blocks long, was divided into sixteen watertight compartments for safety, and carried twenty lifeboats. This was four more lifeboats than the Board of Trade regulations required. The Titanic’s reputation of being unsinkable created an atmosphere of complacency, almost arrogant indifference, from the captain all the way down to the least deck hand. So widespread was this outlook that when the call to abandon ship was made a large number of passengers refused to believe what they were told. There was a casual approach to safety in the minds of the ship’s officers as evidenced by the things that were not done. No formal boat drill was arranged for passengers, a normal procedure to ensure orderly behavior in an emergency. There were lifeboats for only one-third of the passengers, legally correct but hardly responsible, and there was little concern over the danger of icebergs. Radio was a fairly new thing in 1912 and large numbers of passengers used it to send messages to friends in Europe and the United States, describing life aboard the Titanic. The ship’s radio operator was so heavily engaged in sending these private communications that he paid little attention to the warning signals about icebergs from other ships. Some urgent messages about icebergs that arrived at noon did not reach the navigation officer until 7:00 P.M. Even a drop in the outside air temperature around the ship, a clear indication of proximity to an iceberg, from forty-three degrees to freezing in the course of one day was ignored by those in command. Sunday, April 14, 1912, was cold but visibility was good. Messages kept arriving from other ships warning of the presence of icebergs in the main shipping lanes. The Titanic’s Captain Smith still seemed indifferent to these warnings. It was well known that most of an iceberg’s bulk floats below the surface so it was always important to keep a safe distance from the part one could see above water. Captain Smith may have been more concerned with the hope of gaining a new crossing record because, instead of slowing down to make sure that the ship kept well clear of icebergs, he maintained a speed of twenty-two knots, about 25 mph, a high speed for ships at that time. Shortly before ten o’clock in the evening the seventh ice warning of the day arrived, telling of a huge mass of ice less than eighty miles directly ahead. An hour later an urgent message was sent to all ships in the area from a ship, the Californian, twenty miles away, which had stopped its engines because of an eighty-mile stretch of ice directly ahead. At the same time, the Californian’s radio operator tried to call the Titanic but, finding that he was met with a blunt “Keep out” response, decided to retire for the night. Close to midnight, as the Titanic pushed ahead, lookouts in the crow’s nest, high up on the foremost mast, spotted an iceberg off the right side of the ship, almost directly ahead and towering sixty feet above the water. The warning signal was triggered. The engine room was ordered to stop the ship and then go full speed astern, but the warning came too late. Even as it began to swing away toward its left side, the ship hit the iceberg below the surface. The crew felt a bump and heard a scraping sound. They concluded that nothing serious had happened but the first officer as a precaution decided to close all the watertight doors below the waterline. The elapsed time from the moment of sighting until the watertight doors were closed was about half a minute. The ice had gashed a series of openings in the steel side of the ship and water was pouring in. Within ten minutes, fourteen feet of water filled the forward part of the ship. All five compartments were flooded and, after another ten minutes, water rose to twenty-four feet above the keel. Captain Smith and the managing-director of the shipyard that built the ship, Thomas Andrews, were by now on the bridge assessing the damage. Andrews knew that the ship could only stay afloat for a little more than one hour if five compartments were flooded and he told Smith so. Distress signals were immediately sent out and preparations made for abandoning ship. The bow area was already sinking. Twenty-five minutes after the first sighting of the iceberg, Captain Smith gave orders that the lifeboats be made ready. The captain knew that the lifeboats could only carry 1,178 out of the 2,227 on board even if every boat was filled to capacity, and he was anxious to avoid panic. Rockets were fired aloft and the Californian, which was still nearby, saw the rockets but the ship’s operator had retired for the night soon after getting the earlier rejection from the Titanic. He had been at his station for sixteen hours. The Californian tried to make contact using light signals but, when that failed, it made no further attempts. Several other ships received the radio signals but they were all some distance away. About an hour after hitting the iceberg the first lifeboat was launched, but inadequate planning together with passenger apathy saw it leave with twenty-eight people instead of its capacity load of sixty-five. Even as this boat was being lowered into the water many passengers felt it was safer to stay on the ship. They refused to believe that the Titanic would sink despite the abandon ship order. Other lifeboats too left with partial loads, one with forty-two, a second with thirty-two, and a third with thirty-nine. Much later, when the tally of survivors was examined, there were questions. Why did one boat leave with seven, two members of the crew and five who were mostly from first-class cabins? Was it impossible for passengers from down below to reach the boats in time because of the barriers that separated third from first class sections of the ship? Approximately two hours after it had hit the iceberg the Titanic was listing heavily to port, its bow close to the water. People found it hard to keep their balance and panic was setting in. As one of the last boats was being launched and was already almost full, a group of passengers tried to jump in. An officer in the boat had to fire two warning shots to hold them back. As another boat was being loaded the crew linked arms and formed a chain around the boat, allowing only women and children to get on board. Captain Smith walked around, thanking various ones for the work done then headed for the bridge to go down with his ship, a long-standing maritime tradition. In the final moments many jumped off the ship. By hanging on to pieces of wreckage or, in a few cases, by being taken on board a lifeboat, some of these survived. The Carpathia, a ship that was sixty miles away, received the distress messages and headed for the location of the Titanic, arriving shortly after 4:00 A.M. long after the Titanic had completely disappeared. For several hours the Carpathia took on board those in lifeboats as well as survivors from the sea, thus succeeding in rescuing 711 who were taken to New York. One thousand four hundred and ninety lives were lost, the worst ever tragedy at sea. Many were lost because they were unable to cope with the near zero temperatures. Ships from Halifax, Canada, were dispatched to pick up bodies. One hundred and ninety were recovered and these were interred in Halifax. Many years later, in 2001, some of these remains were exhumed in attempts at identification, using DNA techniques. A British public inquiry was conducted as soon as the survivors were able to attend. They were delayed for some time in order to answer questions from the U.S. Senate. The inquiry was held in London and it centered on possible navigational negligence on the night of the disaster. Was the ship traveling too fast? Were officers attentive to the various warnings of ice? Why was it that the total number of survivors was far less than the total capacity of all the lifeboats? Were the third class passengers held back and locked below decks in order to allow those in second and first class to escape? The inquiry exonerated the captain and crew in words like the following: while the collision with an iceberg could have been avoided it was not a direct result of negligence on the part of either Captain Smith or any member of his crew. Captain Rostron, Carpathia’s skipper, was commended by members of both U.S. and British authorities for his courageous efforts to reach the Titanic in time to save her passengers. In pushing his ship to its limits and dashing through treacherous waters he was seen as a true hero. The captain of the liner Californian, on the other hand, was regarded as almost a villain because he did not do all he could to save lives. Almost immediately after the public inquiries were completed dramatic changes were made in the rules regarding icebergs and lifeboats. The International Ice Patrol was instituted, ensuring constant watch on errant icebergs, and winter shipping lanes were moved farther south. Twenty-four-hour radio watch was required for all ships and sufficient lifeboats to accommodate everyone became mandatory. These outcomes from the U.S. and British formal inquiries concentrated on the shipping errors and loss of life, but beneath all of these and only lightly touched on by the investigators lay some serious social issues. Not least of these was a tradition of class distinction when filling lifeboats. While the owners of the Titanic denied that any such practice existed, it was well known among other ships of that time. When the liner Republic went down, four years earlier, the captain told the passengers as they approached the lifeboats, remember women and children first, then first class passengers followed by all the rest. Whatever might have been the unspoken rules on the Titanic, the reality was blatant discrimination. Out of the first class women passengers, 3 percent lost their lives, while 16 percent of second class women drowned, and in steerage, the lowest class, 45 percent of the women died. The barriers set up to keep the different classes of passengers from mixing became death traps. Steerage passengers were seen climbing out on whatever protrusions they could access on the sides of the ship in order to reach a deck above the water. When the last lifeboat was launched and the ship’s officers were convinced that all women had been accounted for, dozens suddenly appeared from steerage sections. Such was the pathetic lack of organization for coping with an emergency. Two women from steerage were stopped as they walked toward one of the boats on the first class deck and ordered to go down to their own deck to board there, something that was quite impossible at that stage. This traditional class distinction appeared again in New York as the Carpathia brought survivors ashore. Survivors’ stories became headlines in newspapers but they were almost all from first class passengers. The horror of more children from steerage being drowned than men from first class was hardly noted. Investigators from both members of Congress and the British authorities ignored the steerage passengers. It was a similar story among the media representatives, at least for a time. Then questions began to surface about how some important men survived while a hundred women were lost. By exposing so many of these habits of class distinctions, the Titanic put an end to many of them. It destroyed much of an era of privilege that looked inappropriate, even indecent, in the light of the unfair treatment accorded people on that night of April 15, 1912. Seventy-three years later, Robert Ballard and his team from Woods Hole Oceanographic Institution, Boston, discovered and photographed the wreck of the Titanic as it lay on the seabed at a depth of two miles, three hundred miles south of Newfoundland. Ballard’s wish was that all who followed him would respect the site and not interfere with it. He felt it was a gravesite that ought to be left undisturbed. Interest in the wreck, however, was too strong for others to accept that recommendation. Two years after Ballard’s discovery, a French expedition, backed by money from the United States, went to the site and recovered artifacts. The French submersible Nautile, used by the expedition, dived more than thirty times and spent about two hundred hours on the ocean floor. Approximately nine hundred artifacts were discovered, many of them objects that no one knew had been aboard the ship. New light was cast on the Titanic and the condition of the wreck. There was a cache of Spode china with blue and gold patterns that caught historians of the Titanic by surprise. A bag stuffed with jewelry, U.S. banknotes and gold coins was also recovered. Some of the important navigational and communication instruments were also salvaged, such as the ship’s telegraph, operated by a system of wires and pulleys. There were many other interesting objects including sterling silver knives, forks, and spoons, cut-glass carafes, white ceramic egg dishes, a bottle of champagne, a teapot, and a jar of skin cream.